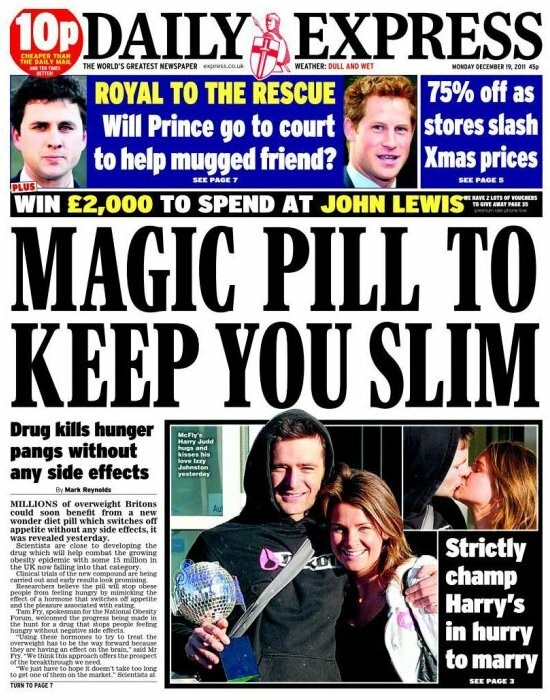 We've been used to the Express excitedly claiming a pill is the answer to a health problem. The tomato pill to beat health disease, the 'wonder pill' to add 20 years to your life, the vitamin pill to beat Alzheimer's, the daily pill to cure diabetes to name just a few. Add to those the 'wonder diet' that cures health disease, the 'miracle diet' to stop heart disease, the 'secret' of how to live longer...and on and on. Now, today, a 'magic pill to keep you slim: drug kills hunger pangs without any side effects'. Millions of overweight Britons could benefit from a new wonder diet pill which switches off appetite without any side effects. Scientists are close to developing the drug which will help combat the growing obesity epidemic with some 15 million in the UK now falling into that category. Regular readers of the Express may feel they've been here before. 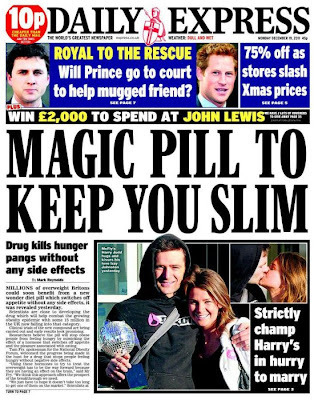 On 23 April 2007, the paper asked: Is a magic pill a cure for obesity? A week later, it was trumpeting a 'magic pill that helps you burn fat without exercise'. Given there is, according to the article, a 'growing obesity epidemic' it appears those 'magic pills' didn't work. Side-effects are predicted to be limited to bouts of nausea, but OAP-189 will have to go through extensive human testing before it reaches the market, which is expected to take between five and seven years. Ah. So there could be 'bouts of nausea' and it could be another 5 years - at least - before the product might be available. After 'extensive human testing'. In which time, the absence, or otherwise, of side effects might be rather more clear. I'm on the very early clinical pre-trials for this pill, and am one of the first 3 people ever to use it. While the nausea is intense, the primary side-effect is far worse. For a few hours, I actually believed headlines like this. Due to this attack of extreme credulity, my wife has lost faith in me, my children have disowned me, and I bought loads of Diana memorabilia from the Daily Express. Please, Tabloid Watch, in the spirit of Jimmy Saville - please fix it for me.